In order to understand and improve cities today, personal observation remains as important as ever; in “Seeing the Better City,” author Charles R. Wolfe presents a comprehensive toolkit for cataloging the influences of neighborhood dynamics, public transportation, urban form and other elements that impact day-to-day life in a city. 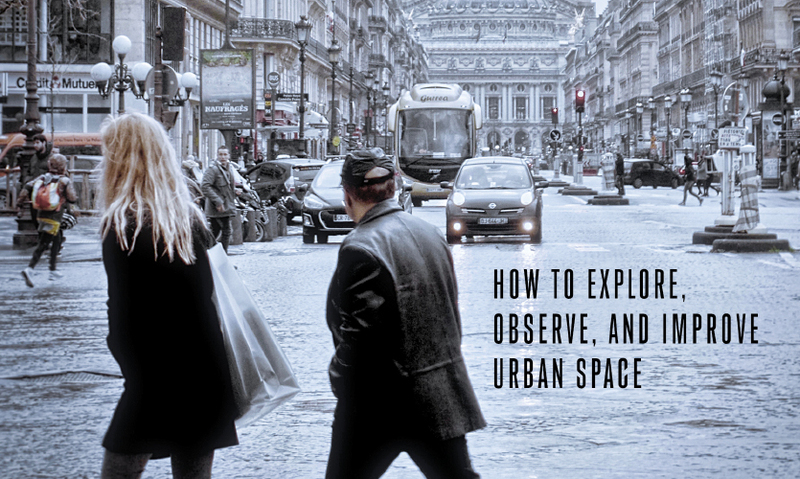 Wolfe calls it the “urban diary” approach, highlighting how the perspective of the observer is key to understanding the dynamics of urban space. He concludes by offering contemporary examples and guidance on how to use carefully recorded and organized observations as a tool for constructive, creative discourse about improving urban space. Wolfe provides a unique perspective about cities as a London and Seattle-based urbanist writer, photographer, land use consultant and attorney. He is currently a Visiting Scholar at KTH University (Royal Institute of Technology) in Stockholm and a long-time Affiliate Associate Professor in the College of Built Environments at the University of Washington, where he teaches land-use law at the graduate level. Wolfe regularly does speaking engagements, blogs and has contributed on urban development topics to publications including: Planetizen, CityLab,The Atlantic, Governing, CityMetric and The Huffington Post. He is a Fulbright Specialist through 2020. Before "Seeing the Better City," his first book, "Urbanism Without Effort," is now available as a revised paperback from Island Press. I have previously discussed why encouraging people to sense and, in particular, to see everyday city life deserves a high priority in policies, plans, and project-specific, pro forma spreadsheets developed by and for our political leaders, planners, designers, and real estate professionals. Better cities will not come from a directed “see this” or “sense that” mindset. Rather, better cities are more likely to result if we first learn how to sense the city, understand which urban diary tools (such as photography) we should use, and then critically review or “decode” how people interact with urban space in their local contexts. In-person observation (and later critical review through photographs) of this relation of people to their urban environments is something we can easily call “place-decoding”—looking at urban spaces for embedded and recurring patterns of how people have lived in a place for years, and sometimes even centuries. In my opinion, reviewing and understanding these patterns are the necessary prerequisites to developing future-directed placemaking principles. My photos, as interspersed throughout this book, have that basis in Common. For me, practicing place-decoding is often easier in parts of the world where physical artifacts show by-products of human settlement over extended periods of time, and cities can serve as “classrooms” teaching us how to realize our sensations and experiences. 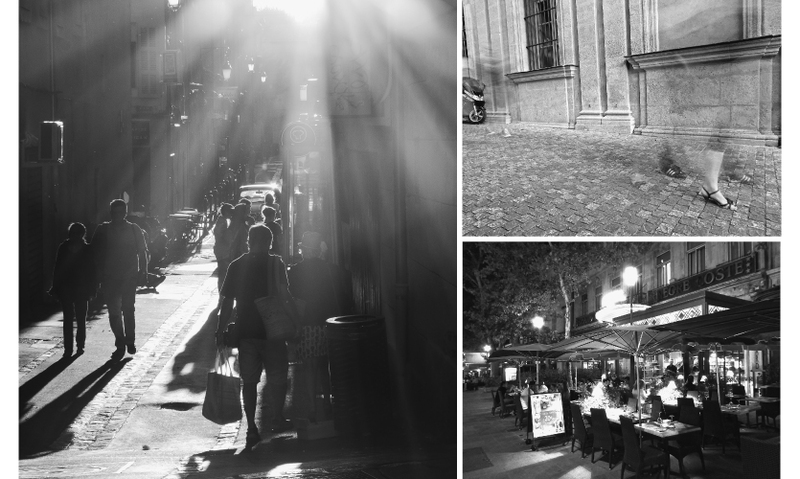 While Seattle has been central to constructing the urban diary model, and Australia another influence because of its indigenous roots and dynamic cities, I have focused especially on France to practice my efforts to sense and understand the relation of people to where they Live. As The New York Times reporter Roger Cohen recently speculated about France’s current struggle with modernity, “Nowhere else is the particularity of place and the singularity of a person’s attachment to it more important.” Cohen aptly summarizes the French people–place dynamic and the relative ease of applying the urban diary approach to French cities and towns. In my opinion, there is nowhere better to see the Old World basis for the role of urban places and how they define who we are in the urban context. Beyond Paris, in the narrow streets and pass-through places of France’s Old World city cores, latent answers to urban riddles await our quizzical view. As the preface and introduction have emphasized, sensing—including seeing—the city is a personal experience owned by each person, whether resident or visitor. From a legal perspective, it is tantamount to an urban property right that transcends public and private domains. Our right to see, hear, touch, and smell the city is our affordable lease, easement or license that allows us to cross space and time and the organic forces of growth or decline. But sensing the city is often manipulated or distracted by other forces, such as intentional design by someone else. Beyond decoding messages for future-directed planning and placemaking, we should understand encounters with the directed “see this” or “sense that” mindset (noted above) that occur in the urban experiential adventure. Observing a place, photographing it, and then decoding the photographs are helpful supplements to verbal descriptions of improved urban space. These visual supplements inform goals such as increased public transit or bicycle use with a more holistic, experiential point of view, and they enhance our ability to sense the city and its internal people–place interactions, as well as to understand where manipulations or distractions occur. Additional apps, tools, and activities are helpful measures; I also suggest more “how-to’s,” such as community classes, meetups, school curricula, trainings, and, finally, sensitizing public officials and loan officers to the underlying human perceptions that influence real estate value. 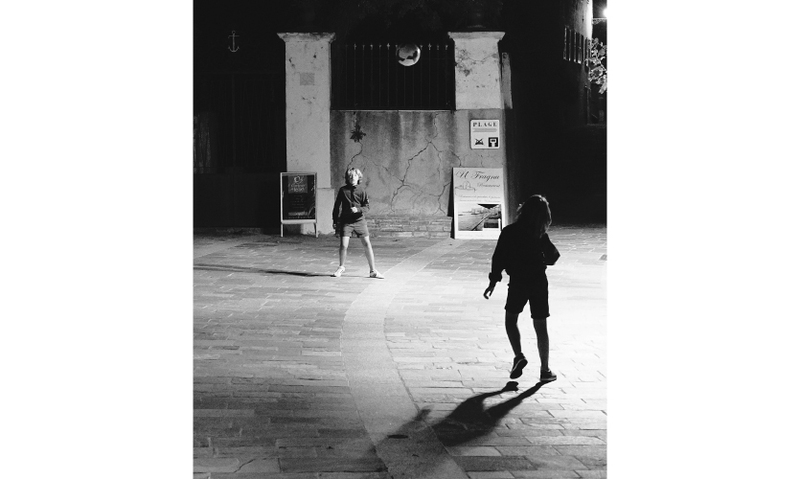 These late-summer photographs show how place decoding works in the historic center of Aix en-Provence and at night in the small Corsican port of Erbalunga. Carefully breaking down each photograph shows ordinary human behavior and natural market processes under way—all of which might arise in the development of policies, plans, and regulations. To me, the photographs suggest questions for urban planning practice and land-use regulation. Are setbacks needed to preserve light and air? How best to assure safe passage for pedestrians? How to honor the walkable places of the past, present, and future? How should a city enable successful interactions of private business and public ways, or create twenty-four-hour safety for street diners and children at play? French cities and towns are also good venues for showing the difference between a homogeneous, directed response to a place and a more self-realized, diverse place-decoding opportunity. In Grasse, France, street odors are apparent and changeable near the Fragonard Parfumerie. Fragonard regularly sprays a variety of perfumes, as illustrated in the first photograph, and channels fragrance above a narrow, pedestrian street. Shoppers uncontrollably encounter the medieval, odor-masking reality that is perfume’s very purpose. Decoding the photograph (with mist above) shows how a design-forced “deodorant of the street” manipulates passers-by. The urban observer must either depart or ignore the smell. In a contrasting French example, the urban observer has free rein to sense and interpret the surrounding setting, without commercial manipulation of what or how to see. 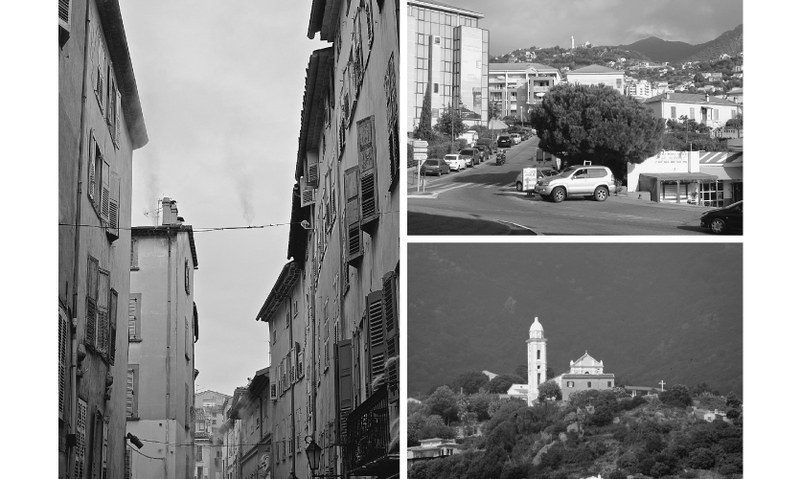 In the multilayered city of Bastia, Corsica, lines of sight span the ages and associated technologies, revealing small pockets of old that blend with the new. As the photographs show, different glances at topography present either an isolated hill-town setting, a traffic-filled city, or both. As a demonstration of the importance of angle of perception, one person may focus on the historic urban form up the hill, while another may see a roundabout of cars in another context, with little regard to the older church above. Decoding the Bastia example gives the urban observer a better chance than does the Grasse example to sense for oneself. When the opportunity is greater, different people will see, or receive, different things, depending on their experiences or their motivation for looking. The context of urban observation and our particular experiences in and orientation to the city are allimportant. The relevance of context becomes important when we begin in a vacuum, with only generic, visual representations. Without contextual clues, cities are like uncompleted spreadsheet cells where we personalize how space meets time. These photographs show how a uniform filter applied to multiple urban scenes quickly warps time and location, and obscures—yet somehow enhances—the reality of a place. The simple idea of obscuring context with a uniform filter informs our point of view about city life. As noted in the introduction, angle and frame of reference are key to what we see. When familiar frames of reference are not apparent, we tend to “fill in the blanks” with our accustomed values, perspectives, and belief systems. 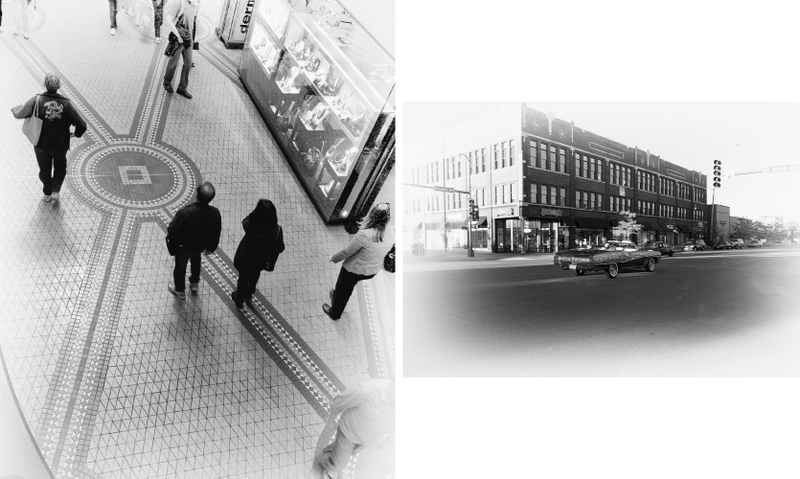 We can quickly assemble generic photographs that illustrate how we interpret uncertain, out-of-context backgrounds. Remove color, then crop, and leave only hints and nuance, and the city can become an off-trail place where questions replace familiar landmarks and clues. • When was the photo taken? • Is the location clear? If so, is it because of personal familiarity with the place? • Is the context of the scene apparent? What more is needed? • Which element of urban life seems most relevant to each picture (e.g., safety, setting, transportation mode, the role of public space, public/private interface)? I recently encountered urban exploration and observation from two different perspectives: first, my own broad-based inquiry in Paris, and then a city-led process in Redmond, Washington (see chapters 4 and 5). The variation in methods shows the range of strategies around urban observation and documenting what people see, as well as the complex overlaps of public and private interests when both cities and stakeholders attempt to maintain and improve urban space. In Paris, I was on a very specific and personal mission to experience, photograph, and understand the human impact of a well-ordered urban space, the Place des Vosges—essentially the first modern public square, and a precedent for many similar spaces around the world. In Redmond, I went downtown to the Old Town Historic Core, where my urban diary ideas were explicitly put to work in 2014 when city staff and stakeholders convened in an "urban diary workshop." The workshop was the first step in a process of addressing how best to interfaces this historic district with overall redevelopment downtown. As a result of making these Paris and Redmond investigations, and after writing about the urban diary idea for five years, I see more than ever the potential for many different urban diary types, from diaries that create a personal way to know the city to those that result from a structured citizen-participation regime, Just as urban diaries may take various forms, they may compel different results. While evocative photography and storytelling can bring home messages from another place, not everyone will view the photographs or their inherent messages in the same way. Similarly, local, stakeholder-based efforts to produce better cities are often complicated by motivations, perspectives, and ownership interests with conflicting goals. One person's desired building height and scale and massing to property lines may be another person's worst nightmare, or the perceived enemy of a historic building. 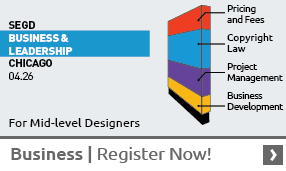 What is the role of intuitive, human-sense-based experience in creating better cities? What is the role of urban observation? Can it resolve the conflicts like the one just described? In one way or another, I have asked these questions of peer professionals (architects, planners, engineers, brokers, and lawyers), developers, elected officials, urban media specialists, and urbanists, and most agree that engaging the public and particular property owners in plans for change is key. From Seeing a Better City by Charles R. Wolfe. Copyright © 2016 Charles R. Wolfe. Reproduced by permission of Island Press, Washington, D.C.